Rediff.com » Business » Is the much-touted Bhavantar project a disaster? Recently, the new Congress government in Madhya Pradesh put on hold the much-feted “Flat Bhavantar Bhugtan Yojana” pending a review of its performance. The scheme, which was touted as India’s first large-scale experiment with Deficiency Price Payment, has been riddled with controversies from the start but was considered a test case for other states where farmers were struggling with falling market prices. Before this, there had been stray attempts to directly compensate farmers for market losses. In 2009-10, for instance, a scheme for betel nut farmers was started in Goa’s Ponda. Under this, the state set the base price at Rs 100 a kg, and paid farmer the difference if they sold below that. 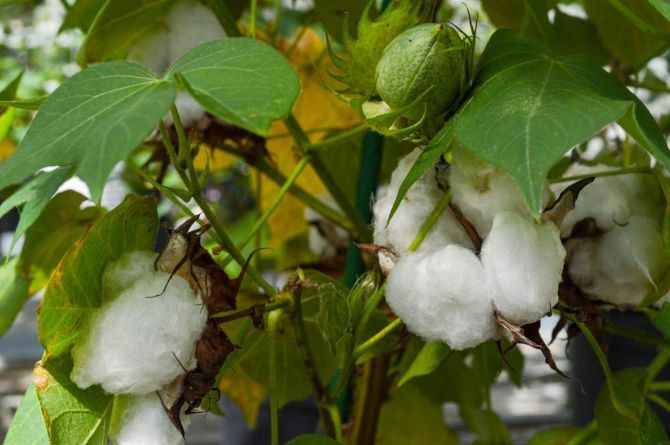 In 2015, a pilot project for cotton growers in the Hinganghat taluka of Maharashtra paid farmers the difference between the minimum support price (MSP) and market price, if the latter fell below the MSP, in their bank accounts. The results were not encouraging, preventing a countrywide rollout. Under the Madhya Pradesh model, registered farmers were to be compensated for a fall in prices below the MSP but the payout was capped up to a pre-fixed “model rate”, which was the average price in nearby mandis. Farmers were required to submit land details along with crop sown, and the average yield for a certain number of years was taken as benchmark for the payments. If the actual price realisation was below the model rate, farmers got the difference between the MSP and model rate. But if the difference was more than the model rate, the payment would be based on the actual difference. This method of calculation was so complicated as was the process of registration involving multiple paperwork that it precluded success. Despite several extensions, just 45 per cent (4.3 million hectares) of the total area under eight crops in which the scheme was launched was registered in the 2017 kharif season, according to an ICRIER paper co-authored by economist Ashok Gulati, Tirtha Chatterjee and former agriculture secretary Siraj Hussain in April 2018. Thus, 55 per cent of the land was not even registered under the scheme. “It is clear that a large number of farmers did not register on the portal and they therefore had to sell their produce at prices which were lower than that of the announced MSPs,” the paper said. For the lentil urad, for example, though the average selling price in the October to December period was 42 per cent lower than the MSP, only 32 per cent of the total urad grown in Madhya Pradesh was compensated under the scheme. In the case of soybeans, the difference between the MSP and average selling price was 12 per cent, and less than 19 per cent of the crop was compensated. The bigger problem was the sharp drop in prices once the sale window under Bhavantar opened. Allegations abounded of farmers conniving with traders to artificially lower market prices to widen the differential between actual price and the MSP, so that the payout could be shared between the two. An investigative report by news website scroll.in published in June 2018 based on RTI responses revealed that Madhya Pradesh farmers lost almost Rs 200 crore owing to such manipulation, which in some cases was done by traders buying the same crop multiple times from a single trader. Several experts, however, have countered this point on grounds that post-harvest arrivals of soybean and urad had risen, which pulled down prices. Plus, they said, the fall wasn’t restricted to the state alone but extended to Maharashtra and Rajasthan for nearly the same set of crops. 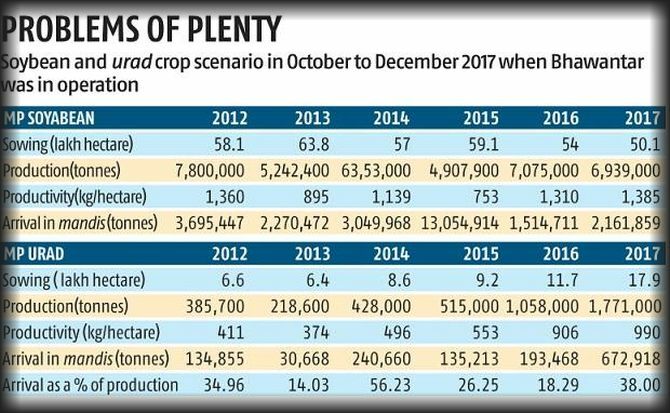 Data culled by Business Standard showed that between October and December 2017, soybean arrivals in Madhya Pradesh mandis was 43 per cent more than the same period last year, while urad arrivals were almost 200 per cent more than the same period of the previous year (see chart). Clearly, Bhavantar was getting messier than anybody bargained for. “Bhavantar was a difficult scheme to operate in the first place. "Moreover, allegations abound that traders milked the scheme to artificially keep prices down, while a significant amount of growers didn’t even register owing to multiple difficulties in registration and were deprived of the payout,” said Mahendra Dev, director of Indira Gandhi Institute of Development Research. In the following rabi season, the government withdrew some of the crops from the scheme (chana, masur and mustard) and decided to buy directly from farmers. This was partly on account of the Centre’s reluctance to share the financial burden of the scheme till a decision on its nationwide rollout was taken (despite its multiple shortcomings other Bharatiya Janata Party-ruled states such as Haryana and Uttar Pradesh had evinced interest). With elections round the corner and farmers facing headwinds from falling prices, the state government introduced the “Flat Bhavantar Bhugtan Yojana”, months ahead of the 2018 kharif season, involving a flat bonus payment fixed at Rs 500 per quintal for soybean and maize. Till the middle of November 2018, state government estimates show that 34 per cent of the growers had registered for the revamped scheme, selling an estimated 6.38 million tonnes of both crops or roughly 20 per cent of the total. Since the registrations continued till January 19 this year, this number is not final. Still, the scheme was considered easier to administer because the calculation was simple and entailed less paperwork. So why did the incoming state government put it on hold? The official reason is that there have been multiple complaints of irregularities. Whatever the reason, this is an anxious time for farmers in Madhya Pradesh.